Happy Sunday MMT Family! Well if you follow MusicMoviesThoughts on Facebook, you know the #SaturdaySoundtrack theme yesterday was inspiration – and we have advance screening passes for a movie along the same line today! The Philly screening of Open Road Films’ LITTLE BOY will be held this Wednesday, April 22. For your chance at passes, click here to get to the gofobo page and follow the “get my passes” prompt. Passes , like theater seating, are not guaranteed and on a first come – first served basis. You can watch the trailer and read the below synopsis for the film, and get additional information at the official website here. LITTLE BOY is a powerful and moving film about a little boy who is willing to do whatever it takes to bring his dad home from World War II alive. The heartwarming story will capture your heart and lift your spirits as it reveals the indescribable love a little boy has for his father and the love a father has for his son. 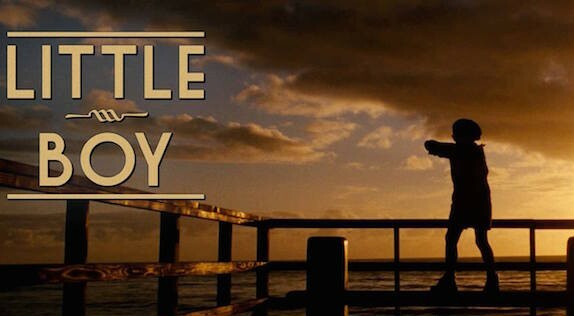 Set in the 1940s, LITTLE BOY is an instant cinematic classic that captures the wonder of life through the eyes of a 7-year-old little boy. Written and directed by Smithsonian Institute Award winning director Alejandro Monteverde, LITTLE BOY highlights themes of faith, hope and love in the face of adversity.